Time is running out to catch the World Press Photo Exhibition that captures some of the rawest moments of human experience in our day and age, up close and personal. This impressive photography collection will be on show until 29th July at Smith and Caughey’s Level 6 Gallery Space, Queen Street. From the state of our precious eco-system to the humanitarian impact of war, witness for yourself at the World Press Photo Exhibition the stunning images that shine a light the significant events of our time. 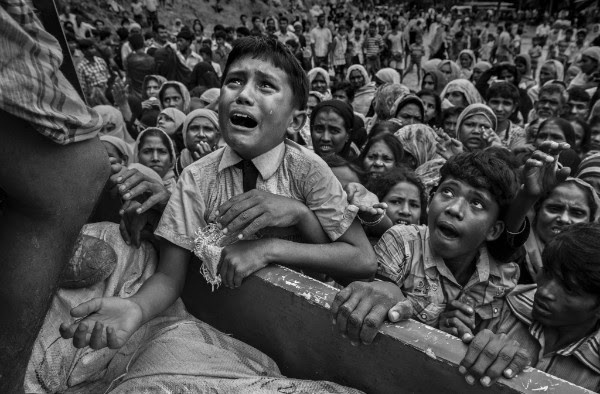 Among the showcase is the gripping image of a young refugee caught in the Rohingya conflict. Tears stream down the boy’s face as he climbs on a truck distributing aid near the Balukhali refugee camp, Cox’s Bazar, Bangladesh. Feel for yourself the urgent desperation has been preserved by some of the most accomplished photojournalists in our midst. World Press Photo receives support from the Dutch Postcode Lottery and is sponsored worldwide by Canon.